The Beriev Be-103 is a seaplane designed by the Beriev Aircraft Company. Intended for autonomous operation as an amphibian in the unmarked areas of Russia's far north and Siberia, the Be-103 was designed for short-haul routes in regions that have rivers, lakes and streams, but are otherwise inaccessible. The Be-103 is a low wing monoplane, making use of the modified wing roots as water-displacing sponsons. It features an all-moving slab tail and retractable tricycle landing gear for land operations. Its hallmark and most distinquishing design feature is the water-displacing wing, an unusual feature for a seaplane, with three aquapaning implements (planing step, port and starboard wing trailing edges) which substantially enhance the aircraft's on-the-water stability and seaworthiness. 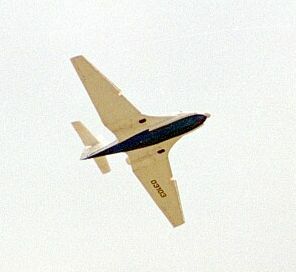 The Be-103 features include an advanced, blended wing, swept at 22°, with 11-foot-long fixed leading edge slats, trailing-link main landing gear, and three-bladed MT-12 reverse pitch propellers. Fuel is stored in the wet wings. The aircraft is built from aluminum-lithium alloy with titanium used in high-stress areas. A 30-paramater, five-hour flight data recorder, engine fire-detection systems and an ice detector are also standard. When flying solo, ballast must be placed near the right front seat due to center of gravity issues. The Be-103 received its Federal Aviation Administration type certification on 21 July 2003 at the EAA AirVenture airshow in Oshkosh, Wisconsin, where the aircraft had arrived via An-124 airlift. The type certificate was handed over by the FAA's co-chairman of regulations and certification, Nik Sabatiny. The aircraft is also certified in Brazil, the People's Republic of China and Russia. On 1 August 2003, FAA Director Marion Blakey visited the Be-103's display area at the exhibition in order to familiarize herself personally with the aircraft and to meet representatives of the developer, manufacturer and Air Register. The obtaining of FAA certification allows official sales of the Be-103 to begin in the USA and Canada. After the exhibition, the first production Be-103 aircraft were officially handed over to its American dealer, Kent Linn of Sky Manor Airport in Pittstown, New Jersey. To date, three aircraft are registered in the USA and situated at the customer's base in New Jersey awaiting resale. Domestic and international market demands (until 2015) are estimated at 520 and 250-330 units, respectively. The Be-103 "Snipe" amphibious aircraft is the first Russian certified in the "Normal category USA" and remains the only new twin-engine amphibian available for purchase today. G.M.Beriev Taganrog Aviation Scientific Engineering Complex Press-release No.8, 24 April 1998. ↑ 1.0 1.1 1.2 1.3 1.4 1.5 "From Russia with love", AOPA Pilot, October 2004. PDF file available at beriev-usa.com. Retrieved on 2007-01-06. This page was last edited on 5 March 2007, at 21:12.